Floral pieces can be soothing for family members to look at when dealing with visiting hours, viewing and a funeral of a beloved grandparent. Grandchildren have several types of floral pieces to choose from to set up on, or near, the casket or grave. Order or arrange a floral piece for your grandparent's funeral that is affordable and shows your heartfelt loss. Grandchildren can enclose a satin heart, circle or cross with fresh or silk flowers arranged on it on the inside cover of the casket. This "lid" piece that is similar to an over-sized corsage is made with one flower for each grandchild. The floral piece is secured to a lightweight satin piece that is pinned inside of the cover. It is on display during the viewing hours and funeral. The piece is left inside of the casket and is meant to be buried with the grandparent from the grandchildren. If your grandparent had a deep faith, a cross with a spray of carnations or a floral rosary is appropriate. A heart with rose buds speaks of your love. Have "Grandfather" or "Grandmother" written in gold or silver on a ribbon that cascades from the piece down toward the body. Grandchildren can make or order a casket spray made from garden flowers from their grandmother's garden or her favorite annual and perennial blossoms. The spray is the main floral display at the funeral and the cost can be divided among adult grandchildren to reduce the expense. Gladiolus, carnations, roses, daisies, chrysanthemums and spring flowers can be used to make an impressive arrangement. When honoring a grandparent with a military funeral, there can be no flowers on the casket because the flag is draped there. Container arrangements, easel sprays and plants are appropriate. Make or order the pillow that is set at the very edge of the casket near the head of your grandparent. The pillow is constructed of heavy floral foam or a satin covered form which has fresh or silk flowers "picked," pinned or inserted into it. The center or entire surface is covered with flowers such as chrysanthemums, carnations, roses and cedar or leather leaf greenery. It represents the final rest of the deceased. Center a framed photo of your grandparent in the middle of a ring of flowers on a display table when there is a cremation urn or container at the funeral home. The ring can be covered in your grandparent's favorite flowers or blossoms from the family flower garden such as lilies, daisies, roses and iris. 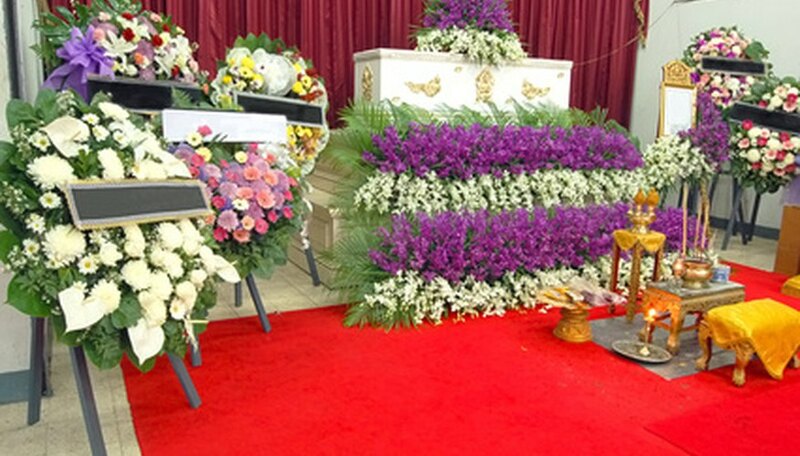 Grandchildren can choose to have a floral blanket cover the grave after the burial. It will lie on the foot area of the casket at the funeral home or church. The blanket is a rectangle of chicken wire that is completely covered with greenery and dozens of flower blossoms. If the burial is a cremation, the blanket will be draped appropriately by the funeral home attendants who are helping your family. As a group, the grandchildren can choose to plant rosebushes or set out potted plants for the service. The plants can be set into the ground at a later date at the grave or sent home with your surviving grandparent or parent for a memorial garden at home.